It’s always fun to have great escapades to talk to friends and co-workers about that most people you know have not been to. And this is one of those. Actually, two of those, combined into one. The flight from Dallas to Ixtapa-Zihuatanejo is about 6 hours and can be as low as about $600 roundtrip depending on when you book the flight. Ranked in the top 100 hotels in the world, built atop a cliff, overlooking the ocean. With 3 restaurants on-site, a spa, guest rooms with private pools with ocean views. Outdoor pool with restaurant service. Up-to-date fitness gym, massueses. 24 Hour room service. This fine resort gets a 4.8 out of 5 stars on Hotels.com. 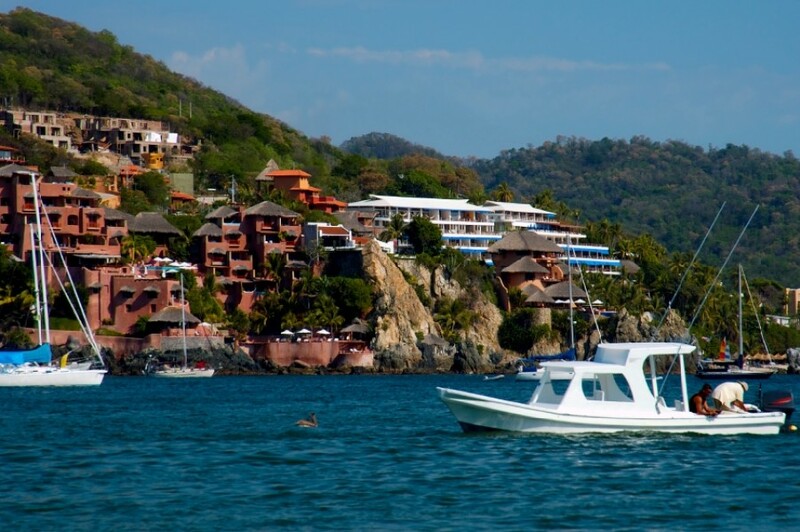 This secluded resort in Ixtapa Zihuatenejo is on a cliff overlooking the ocean. The resort features 3 on-site restaurants, a full-service spa and guest rooms with small, private pools. Capella Ixtapa has a flat-screen TV and free Wi-Fi in every guest room. All guest rooms offer views of the ocean from the private balcony. Air conditioning and a refreshment center with free drinks are also provided. This hotel ranked among the top 100 Hotels & Resorts in the World. Guests at the Ixtapa Capella can use the modern gym or arrange an outdoor massage. An outdoor swimming pool with food and beverage service is also featured. A Mares restaurant at the Capella in Ixtapa serves Mexican cuisine. The hotel’s Las Rocas restaurant serves fresh seafood. The 3-level Terrace Bar features ocean views. Room service is available 24 hours. Viceroy Zihuatanejo is one of Mexico’s premier beach resorts situated on the quiet La Ropa beach in the resort village of Zihuatanejo, 4 miles (6.4 kilometers) from Ixtapa. This resort gets a 4.7 out of 5 stars on Hotels.com. Guests receive complimentary welcome cocktails upon arrival. The resort’s atmosphere is tranquil, with guests lounging by the pool, strolling along the beach, or enjoying leisurely meals on the veranda. The concierge staff helps guests plan sailing, windsurfing, water skiing, fishing, horse riding, scuba diving, and snorkeling. The Viceroy Zihuatanejo features a large infinity pool with a swim-up bar, cushioned lounge chairs and thatched roofs that shade guests on the sandy beach. Meandering pathways allow guests to wander the extensive tropical gardens of coconut palms, bamboo, hibiscus, and bougainvillea. The resort spa provides health and beauty treatments, including massage, sauna, and salon services. The hotel also has a gift shop and an art gallery. The hotel’s in-house La Villa Restaurant is located next to the beach and serves authentic Mexican, French, and International-style cuisine, as well as, Mediterranean-style dishes and seafood entrees. The hotel also has 2 other bars: La Marea Bar and Coral Bar.